When you think of new food scene cities, my bet is that Nairobi, Kenya might not make your top ten list. It certainly wasn’t on my radar. That is until I saw vocalist, songwriter Natalie Brown posting about her delicious Nairobi food experiences in her social media channels. Even her backyard monkey visitors are foodies! Natalie is a talented songstress whose vocal qualities have been called soulful and powerful. Her original songs take us into her world in a compelling and multidimensional experience. I love listening to her tell her stories through her songs. But really her songs make me happy. You’ll see er hear. 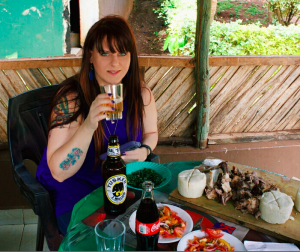 Natalie graciously agreed to write a guest post for Diva Foodies about her Nairobi food adventures. I am a Canadian born vocalist, songwriter and video blogger who has released 5 albums of R&B/Pop music since 2000. I’ve lived in the US and Canada and recently moved to East Africa. As an avid lover of adventure and food, I love to delve into local cuisine. My video blogs document my music, travels and food experiences. My aim is always to inspire my listeners to #doitnow. Diva Foodies: When one thinks about the global food scene Nairobi, Kenya doesn’t usually make the Top 10 list. How are you finding the food scene in terms of quality, diversity and of course deliciousness? Natalie Brown: It’s actually too bad that Nairobi is not known in Western circles for the amazing International food destination that it is! 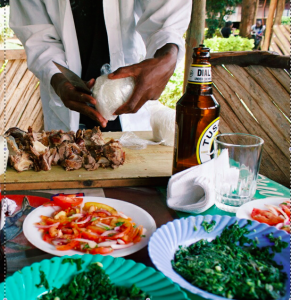 Nairobi has every kind of food you could imagine as well as lots that you have never heard of. I have lived in major US and Canadian cities and this seriously rivals most of them for the amazing cuisine. I find the quality of food to be excellent since GMOs are largely not a thing here and the meat here is mainly antibiotic- and hormone-free (much of it labeled “Halal”). My experience in Nairobi is that the food tastes different because the food sources are pure and natural and that has made for a very interesting experience. There is such a diverse representation of cuisine here. 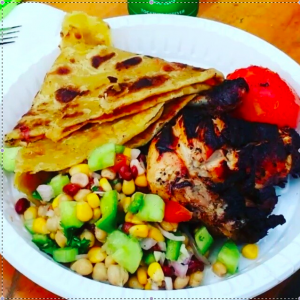 I haven’t even begun to scratch the surface and I have had American, Canadian, Asian, Pakistani, Indian, South American, Kenyan, Mediterranean, BBQ, Italian, Street food… I mean, you name it, they have it! As for how delicious… I have literally been eating my way through the city and suburbs and have only had a few dishes I would rate a C+ at this point. There is a lot of pride and attention where food is concerned here. Diva Foodies: What are a few typical Nairobi dishes that are a must try? Ugali (Cornmeal Staple) – The most common Kenyan food staple is ugali – usually made from cornmeal that is added to boiling water and heated until it turns into a dense block of cornmeal paste. Githeri (Beans and Corn) – This is a Kenyan dish that consists of boiled beans, corn kernel and is sometimes mixed in with a little bit of vegetables. Sukuma Wiki (Collard Greens / Kale) – One of the most popular vegetable Kenyan dishes is sukuma wiki (known as collard greens or a form of kale in English). The nutritious green leafy vegetable is often cooked in oil with a few diced tomatoes, onions, and flavored with a sprinkle of mchuzi mix (Kenyan flavoring salt) or stock cube flavoring. Kenyan Stew – Kenyan stew can include a number of different meats: beef stew, goat stew, chicken stew or any other animal stew. Kenyan stew dishes might also include a few other base vegetable ingredients such as carrots, peppers, peas, or potatoes. The sauce is usually formed from a light tomato base and accented with onion, salt and pepper, and that essential mchuzi mix! Nyama Choma (Roasted Meat) – Goat and beef are the 2 most common forms of nyama choma, but chicke n (kuku choma) and fish (samaki choma) are also eaten. Kachumbari (Tomatoes and Onions) – The simple formula of diced tomatoes, onions, chili peppers, cilantro, and sometimes avocado, is a natural power combination of vegetables that cultures all the way from Mexico to Kenya. Masala Chips (French Fries Masala) – The dish starts with plate of freshly deep fried french fries (chips). Tomato sauce, chili sauce, herbs, cilantro, and whatever else the chef decides are all added to the fries, coating them in a nice sauce. Mandazi (Kenyan Doughnut) – Mandazi’s make a great snack or a light breakfast with a cup of sweet chai. Grilled Maize (Grilled Corn) – One of the most popular on-the-go snacks in Kenya is a cob of roasted corn. The corn is picked when it has become mature, so it’s a dry starch that is perfect for roasting over hot embers. As the corn roasts, some kernels pop like popcorn while others blacken to a crunchy crisp. Some street stall vendors will supply a chili lime salt garnish for the grilled maize. Samosas – Another Indian snack turned Kenyan food are samosas. These are small triangular pockets of spiced meat or vegetables put in a pastry wrapper and deep fried to a golden brown. Chai (Kenyan style tea) – Tea is the most popular hot drink of choice for many locals. Kenyan tea is brewed dark, mixed with whole fat milk and sweetened up with sugar. It is interesting to note that in Kenya I have not found any white sugar… what they call white sugar is what our light brown sugar in North America looks like. Diva Foodies: Thanks for amazing primer on Kenyan food! You’re from Canada. Are there foods you miss that are difficult to get in Nairobi? Natalie Brown: Everything I could get in Canada or the US is available here so there isn’t much I miss. The one thing that I found difficult to get here is Poutine! This is a French Canadian dish of squeaky cheese curds, fries and gravy. I was at one of the many shopping malls here in Nairobi and saw one of the Food Court vendors selling “Poutine”, but it turns out it was basically Disco Fries… that’s the closest I got. Diva Foodies: What has been a favorite restaurant experience? Natalie Brown: Hard to pick just one as we’ve had a real treat going out a lot since we got here but I would say that my experience at Carnivore Restaurant was amazing as it was such a fun, entertaining dinner. The concept is all you can eat meat and they roast the meat in a huge fire pit on premises which you can watch… it’s basically a Brazilian churrascaria. They have beautiful décor and an entertaining waitstaff. 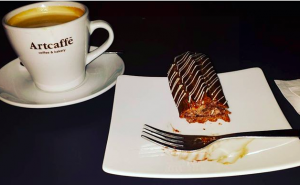 Our favorite ‘go to’ place has been ArtCaffe, which is a Coffee House/Bakery/Restaurant Bar with 11 locations around the city. They offer a wide range of dishes and are open quite late so we can go sit on the patio and have supper and drinks till the early hours of the morning. Their staff is really great also! Diva Foodies: We understand there is some great ‘street food.” Found anything you particularly like? 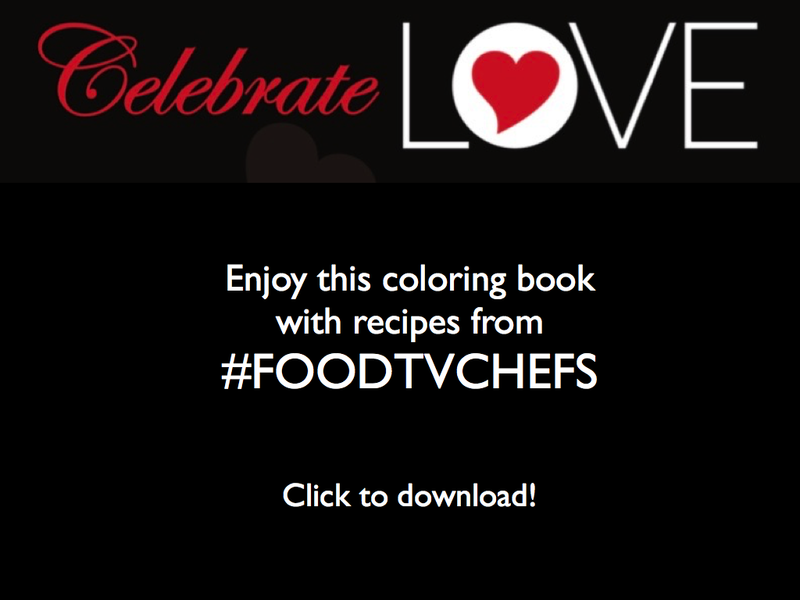 Diva Foodies: Let’s talk a little about home cooking. What fresh ingredients are you finding that might be different to those in Canada or the States? Natalie Brown: I’ve started cooking with a lot more fresh ingredients here since basically you can get fresh food on every corner and for whatever reason it lasts longer than my fresh groceries did when I lived in the US/Canada. I think this has to do with the fact there is less transport time from field to table. I have been using sukuma greens, avocado and mango a lot. I also use Ghee as a cooking oil which I wasn’t using in Canada or the States. One thing that really surprised me here was the taste of the tomatoes. I think before I came h ere I had not really ever tasted a proper tomato. They are lovely and sweet here! The things they have here are pretty much available at any grocery store around the world. The difference I would say is the taste. The food tastes more ‘real’ here and I think it is because of how it is grown and harvested and there is less time in transit since the food is all grown so close to where it is taken to market or to grocery store. 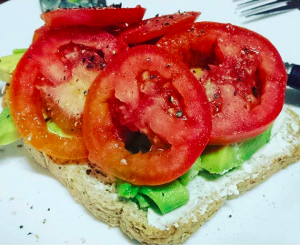 Diva Foodies: How has your cooking changed since moving to Kenya? Natalie Brown: I have been cooking with a lot more fruits and vegetables than I did in Canada/US. The produces lasts longer and there is so much fruit readily available. Fresh fruits and vegetables are very inexpensive here so I am more inclined to buy and use them. 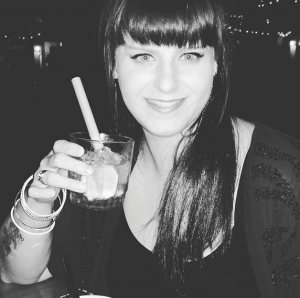 Diva Foodies: We have to ask… what Natalie Brown tunes would best describe the food in Kenya? Natalie Brown: “It’s A Beautiful Day”…. I say this because it’s so sunny, breezy and fresh here and I think that “It’s a Beautiful Day” embodies those qualities! 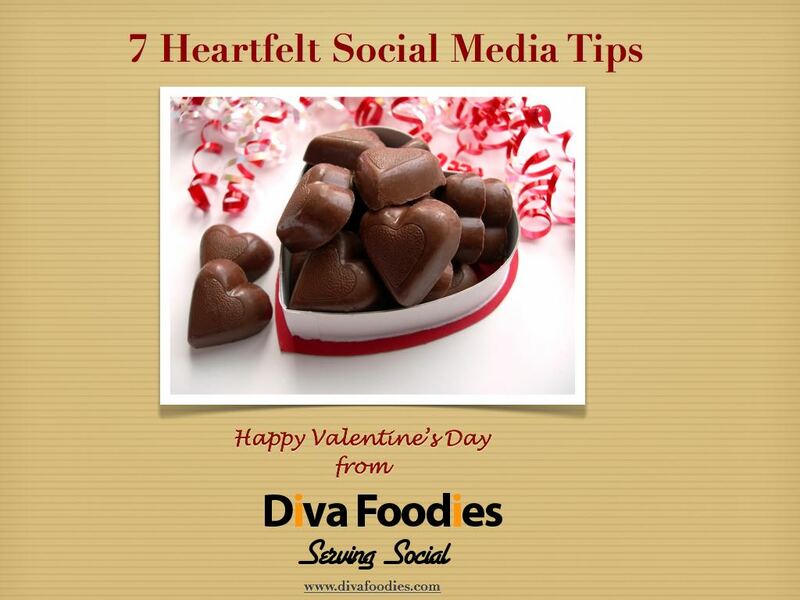 Diva Foodies: In Diva Foodies tradition, the last word is yours. Wrap this up anyway you’d like Nat. Natalie Brown: Coming to live in Kenya has opened me up in so many ways. I think too many people have been subjected to and believe the negative propaganda about Africa in general. Kenya has such a diverse, bustling and vibrant culture. Entrepreneurship and education is highly valued here and there is such an explosion of technology and innovation that I find exciting to be in the middle of. There is a great sense of hope and confidence among the people I have met and it’s contagious! I have just begun to get my toes wet as far as what East Africa has to offer. I find each day a stereotype is challenged and I learn something new and beautiful. As a food destination, Nairobi would be my #1 pick out of all the cities I have lived in so far. The people are beautiful, the food fresh, the weather amazing! Many people said to me before I came that Africa would steal my heart and I understand now why they would say this. I love to sit outside with a glass of wine or cup of tea and listen to the wind in the leaves and the sounds of nature all around me. It’s the most soothing feeling in the world and I wish that everyone could experience it at least once in their lifetime. 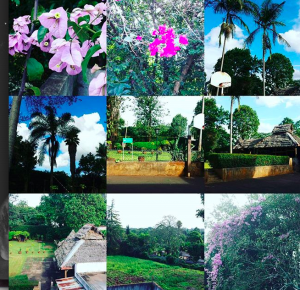 Kenya is a magical place, that’s certain. 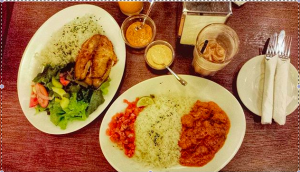 Diva Foodies: Thanks Natalie for sharing your view of the Nairobi food scene and what is sure to be the beginning of your exciting Nairobi, Kenya Food Adventure. I’m thinking… Nairobi should be on my Top 10 Food List! Connect with Natalie Brown! Enjoy her amazing music, photos and thoughts about food and life! Love it. International perspective makes the world a smaller community.